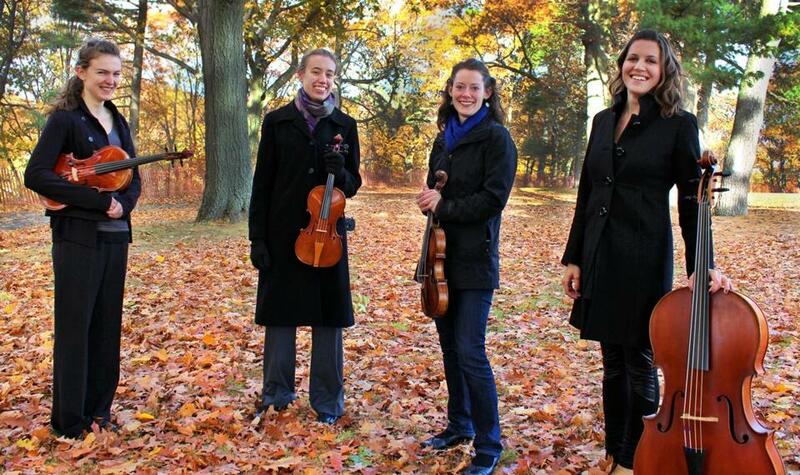 The Emergence Quartet (from left) is Zoe Kemmerling, Lisa Goddard, Emily Dahl, and Emily Davidson. Even though the forms that have become common musical currency — sonatas, symphonies, concertos — underwent lengthy, complex processes of development, we sometimes talk about them as if their materialization was some discrete, easily pinpointed event. A prime example is the string quartet, which is commonly said to have been “invented” by Franz Joseph Haydn around the middle of the 18th century. In fact, the development of the form unfolded gradually, tentatively and in overlapping phases. An inventive program in the summer series of the Society for Historically Informed Performance (SoHIP) is meant to tell at least part of that story. Titled “Birth of the String Quartet,” it includes pieces for two violins, viola, and cello by Georg Philipp Telemann, Johann Friedrich Fasch, and Franz Xaver Richter, three composers in whose work the quartet grows out of its Baroque origins, and ends with a quartet from Haydn’s Opus 1 set. The three performances come courtesy of the aptly named Emergence Quartet: violinists Emily Dahl and Lisa Goddard, violist Zoe Kemmerling, and cellist Emily Davidson. The period-instrument group formed last fall, and gave its first performance earlier this year. It was the brainchild of Davidson, a Baroque cellist who was looking to form a chamber ensemble, and was surprised that there didn’t seem to be a regularly performing quartet in Boston’s thriving early-music scene. The Telemann sonata that opens the program offers a glimpse of the Baroque rhetoric out of which the quartet emerged. Sonatas of this era usually featured a number of solo instruments and a bass line, with figuration that functioned as the harmonic guide for a continuo player (usually on a keyboard). What’s notable about the Telemann piece, Davidson explained, is that there is no continuo part indicated. The cello line simply functions on its own. “That’s a pretty big defining factor, if we start to see stand-alone bass lines, rather than a line with a figured bass above it that’s intended to be played by a chordal instrument,” she said. Given the adventurous writing by these two rather obscure composers, Haydn’s G-major Quartet may seem surprisingly conventional. Its five-movement lineup resembles that of a divertimento, an older form, more than what we think of as a string quartet. The melodic writing centers almost exclusively on the first violin, with the three other instruments in a secondary, accompanying role. None of Haydn’s later innovations are present. And yet, there is an unmistakably idiomatic feel to the music, as though it offered a distant foreshadowing of what was now on the horizon.